What better way to approach the end of the term than to celebrate the gorgeous and varied creations of our students here at Little Picasso’s. Beginning with all things floral the children have steadily built on their skills this term, embracing portraits, plants and of course…the circus! Throughout, the studios have seen an explosion of ideas and colour as children have explored line, shape, pattern and form, creating stunning and unique works of art. Students have been encouraged to use a broad range of mediums this term too – building up hands, adding layers, developing confidence with materials, problem solving and having fun as they go. It has been a delight to watch the students become absorbed by some of the new processes and we have had lots of success trying our new ink pens, experimenting with glass/ceramics and incorporating a variety of both two and three dimensional pieces. PEE/PRESCHOOL: looking mostly at line and shape, students created an amazing array of colourful artworks in the theme of the circus. ADVENTURERS: From winter portraits to colourful clowns, our adventurers have been carefully using shape, lines and patterns to build up their pictures. They have explored elements of colour theory using analogous and complementary colours to create balance and harmony with their clown portraits, adding layers of collage to complete their work. We can’t wait to see how their lovingly crafted circus clowns look when painted with their choice of vibrant colours! EXPLORERS: Our explorers have used simple line and detail to compose these stunning patterned self-portraits. Marking out their compositions with pencil they continued their line study, adding thick and thin lines to build up shapes and filling with intricate patterns. 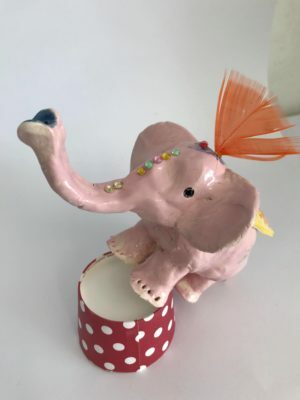 This was a great introduction into circus performers where they have portrayed wonderful circus tent scenes (drawing and sculpting with clay and cardboard) once again capturing the imagination with their use of vivid colours, details and movement. ADVANCED: Wonderful work from our advanced students as they explore design elements to capture these bold native flowers this term. Moving on then to three dimensional pieces, our students have recently completed their gorgeous clay leaves, lovingly layering them with glaze and glass insets. An exciting finish to the term as they carefully bend, fold and wrap their wire and plaster sculptures, bringing to life their elegant and nimble acrobats. SPECIALISTS: At this level many of the artists choose their own path of exploration which is so exciting to see how the work and ideas unfold. Another fabulous term of work. Well done to all our wonderful artists!